A few weeks ago I wrote a post offering our support to Dreamworld following the tragic accident that occurred there late in 2016. But then I thought that I should continue that support by actually going to the park. This is something I hadn’t done for quite some time. So when I saw that they were celebrating their 35th Anniversary and offering special 35 day passes I jumped on line and grabbed myself and Ben a pass each. As soon as I walked in the front gates and saw the familiar Dreamworld fountain, it felt like seeing an old friend for the first time in ages. The Dreamworld Fountain is the first thing you see as you walk in the entrance. If you are a bit of a thrill seeker, then Dreamworld is just the place for you. It has some of the best thrill rides of anywhere in Australia including the Tower of Terror, Giant Drop, Wipeout, The Claw and the Buzzsaw. Now I’m a bit of a sook but Miss Oz and Ben love all of these rides. However as I have always been a bit of a petrol head, I do like the Mick Doohan Motocoaster. It’s a great ride and even has side cars so younger kids can ride it as well. The Claw at Dreamworld reaches dizzying heights as it swings and spins. Since the last time I visited Dreamworld, there have been quite a few changes made within the park. For starters Dreamworld are now affiliated with Dreamworks. So all the rides and shops in the kids area have been re-branded to reflect this. Characters from Shrek, Madagascar and Kung Fu Panda now adorn favourite rides like the Madagascar Roller Coaster and the Gingy Glider. I loved all the new character themes at Dreamworld. If the rides at Dreamworld are not your thing, there is still plenty to do. The tigers at Tiger Island are without a doubt the most popular attraction. Tigers have been a part of the Dreamworld landscape for as long as I can remember. I love nothing better than watching their antics, especially in the hot weather when they go for a swim. Tiger Island has recently undergone a major refurbishment. There is now a huge covered seating area where you can watch the daily Tiger Shows. In between the shows the keepers are always in the enclosure with the tigers and are always happy to answer any questions you may have. Tigers are one of the most endangered species in the world and the Dreamworld Wildlife Foundation makes significant donations towards Tiger conservation. Many years ago I had my photo taken with a tiger and it was an awesome experience. You can also do a Tiger Walk or Tiger Feeding Experience. Other attractions within Dreamworld include the Dreamworld Corroberee where visitors can experience Aboriginal and Torres Strait Island culture. The Australian Sheep Shearing Show is also enjoyed by overseas visitors and kids. There is also the opportunity to get up close and personal with a koala and have your photo taken with one. There are usually a couple of koalas on display in an enclosure so you get the chance to take some photos of them as well. 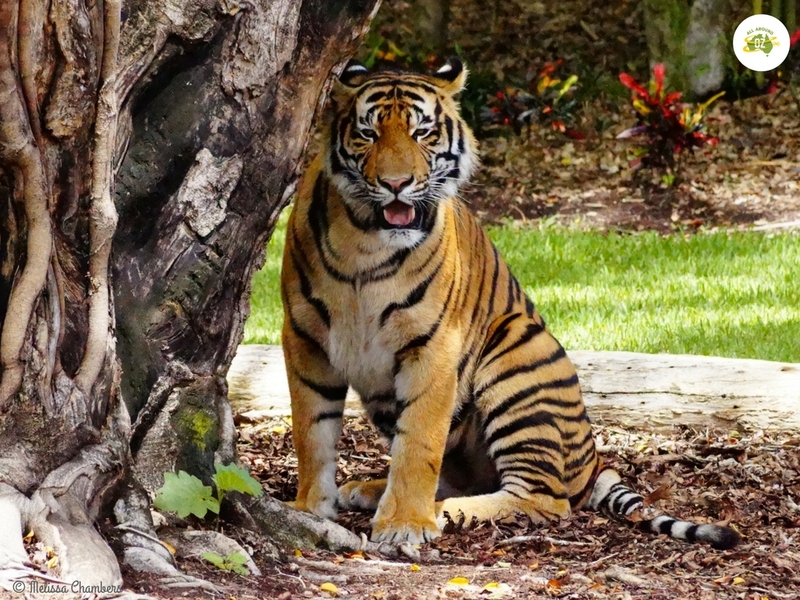 Tiger Island is one of my favourite attractions at Dreamworld. One other attraction that I recommend you check out is the Peter Brock Garage. Featuring a number of original cars and several tribute cars it is one of the best motor racing displays I have seen. He truly was a legend of Australian motor racing and no one can deny how talented he was on a race track. If you feel like a spot of shopping or just want a souvenir of your visit to Dreamworld then there are plenty of shops to choose from. Many of the big rides have their exits come out through the shop for that ride. Yes I know it’s a marketing ploy but you can still pick up something nice. From tea towels to hats, you can find something to suit your budget and taste. Add into this mix the new Lego shop which only just opened. The Lego shop can be accessed from outside the park. It had some very cool stuff in it, including some huge Lego models. There are a large variety of places to eat at Dreamworld. Unfortunately many of these are still very expensive and can take a huge chunk out of a families budget. I did however find that a new addition to the park – the Green Bean Coffee Co has delicious and reasonably priced coffee. A funky vibe and delightfully friendly staff. I would highly recommend it for a quick pick me up coffee. The Green Bean Coffee Co is the perfect spot to stop and relax for a little while. Finally if all the rides have made you a little hot and bothered then why not slip next door into White Water World for a quick cool down. Entry to White Water World is included in your park entry. You can move between the two parks throughout the day. Dreamworld certainly is a great place to visit. It is just fantastic for families as there is so much to see and do. I highly recommend you take the time to visit. You can find out more information about Dreamworld and purchase tickets HERE.